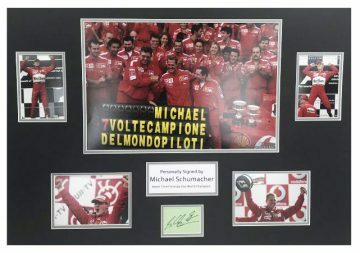 Shop signed Michael Schumacher F1 memorabilia, including signed shirts, caps and other autographed Schumacher Formula 1 item. All autographs come with a Certificate of Authenticity, fast worldwide shipping and free UK delivery, many also with actual signing proof! F1 racing legend Michael Schumacher is a name that captures the essence of the sport – and the hearts and minds of many Formula One fans. The now-retired German race driver certainly made his mark, setting the bar high for new recruits with numerous records for them to break. Schumacher’s love affair with racing began when he was aged just four, after his father added a small motor engine to his pedal kart. He soon became the youngest member of the karting club at Kerpen-Horrem. His father built him a kart from scratch using discarded parts – and at the age of six Schumacher went on to win his very first club championship. His parents weren’t wealthy, and both took on second jobs to support their son’s racing career. With their backing and sponsorship gained through recognition of his promising talent, he eventually rose through the ranks before joining Formula One in 1991 aged 22. Michael Schumacher is known for his incredible skill and fearless penchant for pushing cars to their limit for sustained periods of time to clinch podium finishes. His proficiency and absence of mistakes, in particular, is notable – even in wet conditions. For many, this is the mark of a truly excellent driver. Overall Schumacher has won the Formula One Championship seven times, finishing in second place twice and in third place three times. He’s broken and set countless records – over twenty in total to be precise. These include most fastest laps, most wins at the same Grand Prix, most career wins, most consecutive titles and most Championship titles. Schumacher also inspired some of the most remarkable modern racing drivers including Sebastien Vettel and Lewis Hamilton and is prominent in popular culture having featured in various books, biographies and documentaries. A tragic skiing accident in 2013 left Schumacher paralysed, but he will always be remembered as one of Formula One’s greatest racing drivers.